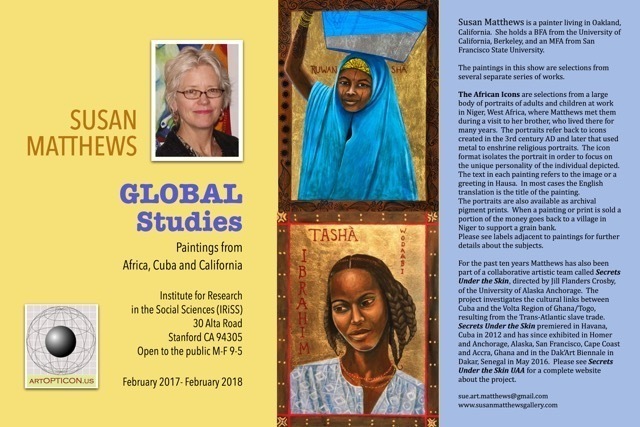 The Institute for Research in the Social Sciences is proud to announce an exhibit of paintings by the Oakland artist Susan Matthews. Global Studies features seventeen acrylic paintings on canvas that depict people whom the artist encountered while traveling in Cuba and Africa (as well as at home in the exotic Bay Area). Vibrantly colored, and drawn with a sure eye for characterization, the paintings are both depictions of sympathetic individuals and, implicitly, a plea for the broader perspectives that come with travel and personal engagement. They oppose the notion of tourism as the taking of photographic trophies: capturing picturesque subalterns before the inevitable ‘spoiling’ of westernization. The majority of the works come from Matthews’ The African Icons series, made during a visit to Niger, in west Africa. By combining metallic foils with acrylic paint, the artist creates secular, contemporary versions of the saints’ portraits common in Christian art since the third century, with the reflective sheen suggesting both preciousness (not preciosity) and immutability: W.B. Yeats’s “sages standing in … the artifice of eternity,” to quote his famous poem, “Sailing to Byzantium.” The Hausa text incorporated into some of the paintings is explained in notes in the wall labels that include details about the portrait subjects and the circumstances under which the paintings were made. “Drinking Water,” for example, is “ a portrait of a young girl carrying water in a plastic basin. Children are always at work. There is no other way to live. Each person in Niger gets an average of one gallon of water per day. Most people bathe and wash clothes in a nearby river.” “Garaya” is “a portrait of a young man who made up his own song and was playing it to the accompaniment of his garaya, a gourd with a few strings. The sound is beautiful. The text reads, ‘See, I really can sing.’” Some of the proceeds from sales of these paintings and from related archival prints goes to support a village grain bank in Niger. 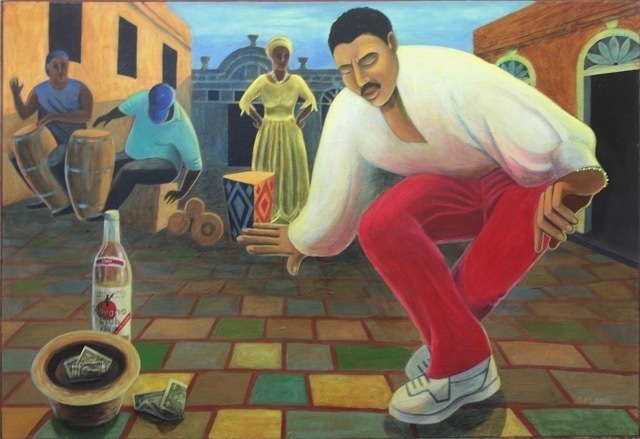 The large painting hung in the foyer, “Rumba Taller Grafica,” depicts the outdoor performance of the Cuban folkloric dance, the rumba; at the Taller Grafica, Havana’s renowned printmaking workshop. The series from which this comes, Secrets Under the Skin, is an examination of the links between African and Cuban cultures due to the slave trade’s involuntary emigration; made in collaboration with Jill Flanders Crosby of the University of Alaska Anchorage, the series debuted in Havana and has been exhibited in Anchorage, San Francisco and other venues, most recently in Dakar, Senegal, at the Dak’Art Biennale. IRiSS is open to the public 9-5 M-F. For more information, please contact Curator DeWitt Cheng at 415-412-8499 and acdcmr@earthlink.net. 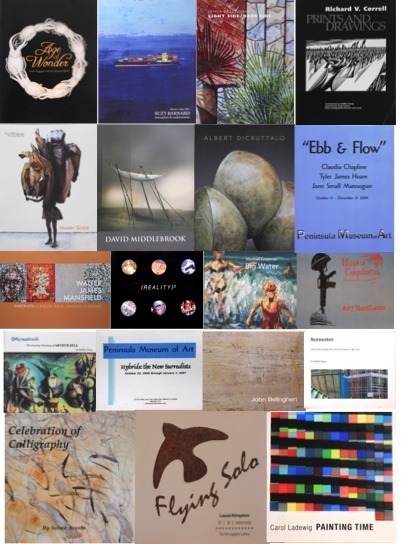 Artopticon.us is the successor program to Stanford Art Spaces; it will also serve, when it goes online in March 2017, as a blog and art magazine focusing on the Bay Area. 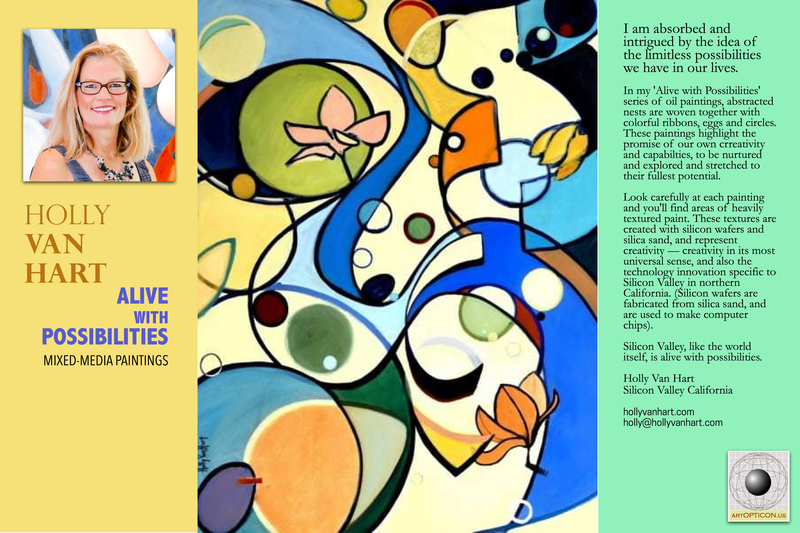 SLAC National Accelerator Laboratory is proud to announce an exhibit of paintings by the acclaimed Peninsula artist, Holly Van Hart. 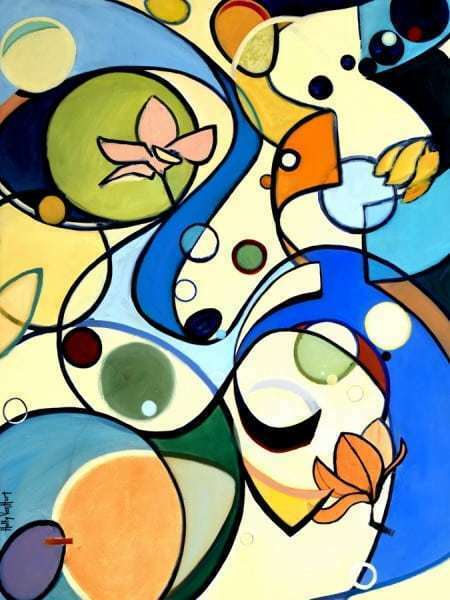 Alive with Possibilities, features eleven geometric abstractions in oil on canvas—with additional elements mixed into the pigment—that communicate the artist’s optimism about the creative life—in art, but also in other areas. Silicon Valley and the Bay Area are known for technological ingenuity, of course, and Van Hart, who became a painter after having worked for a long time in tech, embraces a wider definition that includes even traditional media.